ON Sale "The Captain's" Live Lobster 6 Packs! Mother's Day Is May 12th, And Mom's Just Love Lobsters! And Take An Additional 10% Off The Sale Prices Now Thru May 13th On All Products! Home > 12 Packs Of Lobsters! > Land O' Lakes Butter > Fresh Lobsters! > Live Lobster 6 Packs! Our 6 packs of Fresh Live Maine Lobsters come in a Variety of Sizes!! Pick A Size That Works For You! All orders come with a personalized card with Your Message & Cooking Instructions for easy preparation! You Save BIG When ordering a 6 Pack! Any LobsterGuy product can be purchased and sent as a Gift Certificate! Check the "Send as a Gift Certificate" option here to have us create a hand-written personalized greeting card along a message from you for the value of the dinner(s) or other food items. During Checkout, you'll have a chance to review and confirm your Gift Certificate item, as well as indicate whether to have it delivered directly to the gift recipient, or to you to give as a gift. Your recipient will then redeem the Gift Certificate on our site and arrange a final delivery date of their choice. Live Lobster 4 Packs! • • Live Lobster 6 Packs! • 12 Packs Of Lobsters! DescriptionVideosWhen Do I Get It? 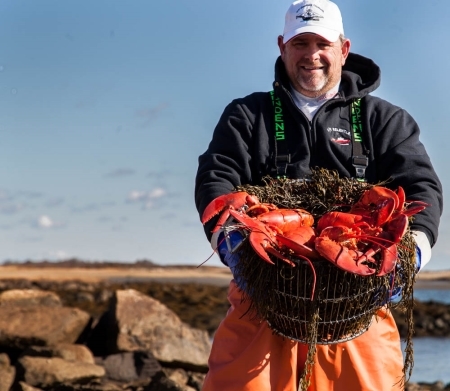 We Will Pack You Six Sweet Succulent Fresh Live Maine Lobsters And Ship Them Fresh Overnight Right To Your Door! A Great Gift Idea, for The Holidays, Anniversaries, Birthdays, or just a Great Thank You! Order Your Live Maine Lobster Six Pack By 10am EST, And Enjoy Them For Dinner Tomorrow! Lobsters Also Make A Great Gift Idea For Your Favorite Seafood Lover! How Easy Is That! You can place your order online or by calling us toll free at 866-788-0004. We ship Monday thru Thursday for delivery on Tuesday thru Friday (NO Sunday or Monday delivery). Moved to Virginia and very much miss my several trips a year to Kennebunkport, ME. Now a 12.5 hours drive and very much missing Lobster and various seafood, so I decided to bring it to me. Lobster arrived about 21 hours after they departed The Lobster Guy. They were ALL alive and very nice size. Had family and neighbors for a Labor Day outing and what a smash with the seafood. Lots of ooh's and aah's, and very sweet tasting lobster. Also ordered scallops and clam chowder everything soooooooooo good. Thanks for making our day great Captain Tim, I will be ordering soon again. They were delivered yesterday afternoon and we were gone until late, and didn't know they were coming. Our neighbor picked them up and today 23rd Dec 2017 they were still very much alive. I checked on them at 1:00 am this morning the 24th and they are still very much moving. We will cook a few today and decide if we want to share or cook and eat on New Years. Thank you so much for bringing a little bit of home to this Army/New England Girl! First time I was home last year in 15 years due to the military! Keep up the great work! Top notch lobster and service. Family loved the feast!! Thank you Lobster Guy. Great Lobster and Great prices and Great customer service! I reply with great news from Santa Fe. Perfect arrival of all 6 lobsters, chowder amazing, and smoked blue fish delicious. Thank you for steaming. I de-constructed all lobsters and re-filled shells for a fork only dinner. YOU ARE THE BEST. Thank you, Kenneth S.
Thanks To Captain Tim and his gang for the best Super Bowl meal we've ever had. Even the snow storm in Illinois didn't stop our lobsters from arriving. Just wanted to post our terrific experience with Lobster Guy. We decided to try them for the first time, and ordered lobster tails for New Years Eve. We had never previously done this, and were a little nervous about the delivery and the product. From start to finish, the Lobster Guy staff was terrific! We received frequent emails about the status of our order, and the lobster arrived right on time, fresh and packed very well, along with a handwritten thank you card! The price was very reasonable, and the product was outstanding. Best lobster tail we have ever had! Your combination of outstanding customer service and an outstanding product will keep us oredering from you for years to come. Thank you! Yo You Fish Headz... My Lobsters And Shrimps were AWESOME... EH ? Keep Up the GOOD WORK... EH ! WE WERE SO SUPRISED WHEN WE OPENED THE BOX AND SAW THE LOBSTERS MOVING . ONCE WE COOKED THEM, WE WERE JUST THRILLED AT HOW TASTY AND SWEET THEY WERE. I CANNOT THANK MY SISTER AND HER HUSBAND FOR BEING SO THOUGHTFUL. special treat for my children and wife to experience for the first time. best lobsters I have ever had! Packed full of meat!! My kids are lobster-lovers now! Ordered two 2.5 lbs lobsters. And did the happy dance all over my kitchen. They came fresh and were just wonderful. Have told many of my friends about The Lobster Guy. Can't wait to order again!! Capt.Tim, For my birthday my daughter bought me a six pack of 1-1/2 pound lobsters. The whole family made short work of them. Great product, we are hooked, we will be back for more.